La Cambre Abbey in Ixelles. Ixelles (French, pronounced [ikˈsɛl]) or Elsene (Dutch, pronoonced [ˈɛlsənə] ( listen)) is ane o the nineteen municipalities locatit in the Brussels-Caipital Region o Belgium. 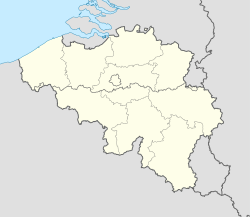 Ixelles or Elsene is locatit in the sooth o Brussels an is dividit intae twa pairts bi Avenue Louise, which is pairt o the Ceety o Brussels municipality. The smawer wast pairt o the municipality includes Rue du Bailli/Baljuwstraat an extends roughly frae Avenue Louise tae Avenue Brugmann/Brugmannlaan. The lairger east pairt o the municipality includes the steids o the Université Libre de Bruxelles an the Vrije Universiteit Brussel, an the Eugène Flagey square. The Bois de la Cambre is locatit juist sooth o Ixelles. The construction o Avenue Louise wis commissioned in 1847 as a monumental avenue bordered bi chestnut trees that wad allou easy access tae the popular recreational aurie o the Bois de la Cambre. It wis an aa tae be the first Haussmann-esque airtery o the ceety o Brussels. Housomeivver, fierce resistance tae the project wis put up bi the toun o Ixelles (which wis then still separate frae Brussels) through whose land the avenue wis supposed tae run. Efter years o fruitless negotiations, Brussels feenally annexed the narrae baund o land needited for the avenue plus the Bois de la Cambre itsel in 1864. That decision accoonts for the unuisual shape o the day's Ceety o Brussels an for Ixelles being split in twa separate pairts. Wikimedia Commons haes media relatit tae Ixelles. This page wis last eeditit on 23 Julie 2017, at 00:10.